Tropitone Montreux Padded Sling High Back Swivel Rocker, 28 lbs. 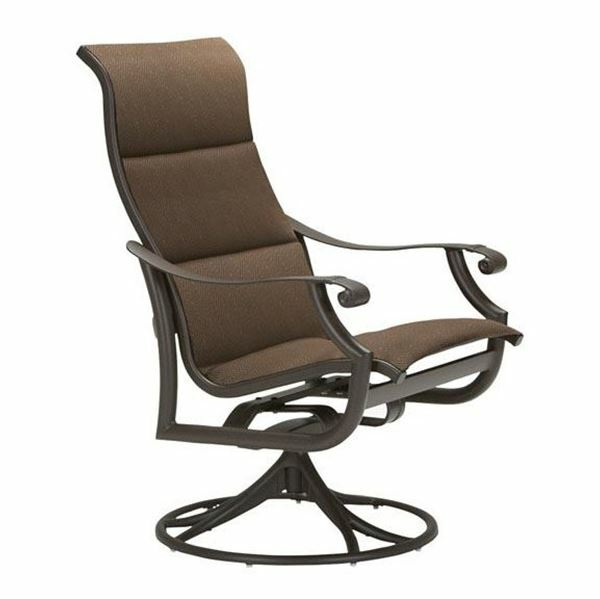 This Tropitone Montreux Padded Sling High Back Swivel Rocker is designed to add a touch of elegance to any industrial patio dining area. The back features an additional 6.5" height over the standard dining chair for a more supportive seat. The well-crafted extruded aluminum frame seamlessly blends into cast aluminum upscaled features and is protected with a strong powder coating. The padded sling features two layers of fabric with fiberfill in the center for a rounded plush seating that is comfortable and air dries quickly. Choose the pattern for both the front and back of the padded sling fabric to match your patio's theme. Perfect on the pool deck of hotels, resorts, HOA communities, and country clubs. Call today to get a great quantity discount on our Tropitone Montreux Patio Furniture Collection. Tropitone Montreux Padded Sling Chaise Lounge, 27.5 lbs. Tropitone Montreux Padded Sling Dining Chair, 16 lbs. Tropitone Montreux Padded Sling Double Glider, 35.5 lbs.